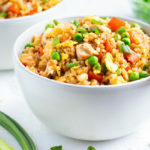 A quick and Easy Chicken Fried Rice Recipe that tastes as authentic as takeout but is made with healthy oil, gluten-free soy sauce, and full of good-for-you vegetables! In a large wok, or large skillet, combine 2 tablespoons olive oil, bell peppers, onions and carrots. Saute for 3-5 minutes over medium heat. Push vegetables to the side and drizzle 1 tablespoon olive oil into the skillet and place chicken in oil. Cook over medium heat for 3-5 minutes, or until chicken is cooked through. Mix with vegetables. Whisk eggs together in a medium-sized bowl. Either push all vegetables and chicken to one side, or remove and place on a separate plate. Drizzle 1-2 tablespoons olive oil in the spot you have cleared and add in eggs, salt and pepper. Scramble in that spot for 2-3 minutes, or until cooked. Once cooked, you can combine the eggs with the rest of the vegetable mixture. Add in cooked rice, soy sauce, rice vinegar, and sesame oil. Cook over medium heat for 10 minutes. If you like extra crispy fried rice, let rice sit over medium to medium-high heat for a full minute before mixing again. Rice likes to stick to the bottom of the pan so be sure to scrape all of the crispy goodness off of it! Repeat this process until to your desired crispiness. Mix in frozen peas during the last 2 minutes of cooking. Top fried rice with green onions to serve and enjoy! See this recipe in Meal Plan #10. It is best to use leftover white rice instead of freshly cooked white rice. Freshly cooked rice tends to clump together and does not crisp up as easily. Chicken fried rice will last in the freezer for 3-4 months or in the refrigerator for up to 4 days.